Cooking in someone else's kitchen: ...or maybe not! Wrote too soon. 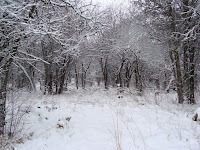 The woods are looking very Narnia-like this morning.